Those of you that are old enough to remember, should remember the countless test that each of us took while attending Elementary, Middle School, High School and College. Back then it seem if we weren't taking one type a test, then the next was followed up by an exam. There were pretest to make sure you were ready for The Test and other test to make sure you knew enough to pass to the next grade or go too the next level. I remember coming home after school, my mind was completely overwhelmed because I had to study for 4 High School exams! When I walked in the door, my mother was standing in the kitchen cooking and said Chuck how was your day at school? Before I could speak she then said son come over here, give your mother a kiss and hug because mama's little man is looking kinda handsome today. Being that at the time I was a skinny kid that weighed only 135 pounds soaking wet, with braces on to correct my buck teeth, I felt at that time that I only had looks that a mother could love . (Smile) Thank God my mother thought I was cute, because back then I sure wasn't Home Coming King material, I was more of the nerdy type. After I hugged my mother I told her I had to study for 4 exams, then she looked at me then said, Chuck since you know what you are good at or what you sure will pass, concentrate on the subjects that are hard to you or give you the most problems. She looked at me as if she could read my mind and said even though you think that they are to hard, I am very confident that if you applied yourself properly, then you could pass any test. I then walked to my room took the books out of my book sack and began to study. After an hour into studying my Father walked pass my door, he looked into my room and said Chuck you are hard at work aren't you? I said yes, Dad but I really hate test. Then he looked at me then said Chuck test are a way of preparing you for the outside world, because believe it or not long after High School and College you will still be taking or preparing yourself for test. Employers will test you, life will test you and you will even be tested, by your friends, family, girlfriend, your children in the future or your future wife. I said well I won't have to worry about children or a wife , Dad because I am not having any children and I don't ever plan on getting married. Then my Father looked at me then smiled and said Son never say never because the things you wish wouldn't happen will happen in time. But today school, is preparing you for life outside of these walls and the ultimate test. The Test of life is not on things you do well, but on things that bring you extreme difficulty or make you feel uncomfortable. If you can pass or handle life while things aren't going well, then you will be able to over come any obstacle that may come your way. Your mother has confidence in you and so do I, School isn't just about taking test, its shaping your mind so you can handle other future test. 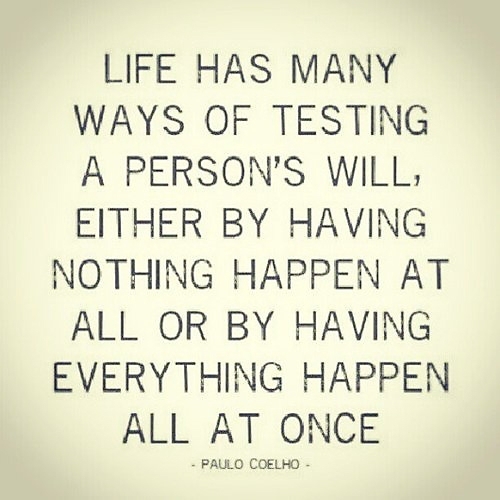 As I now think about my Fathers wise words I know he was right, life does test each of us every single day. Even in our relationships or marriages there is a test, The Test, is can the couple weather a storm , survive a crisis, then over come problems or trouble and then get better because of it. If nothing changes or if it happens to make things worse, then the relationship or marriage has problems, but if the couple becomes stronger or more united than ever before. Then they have passed the ultimate test and are truly meant to be together forever. 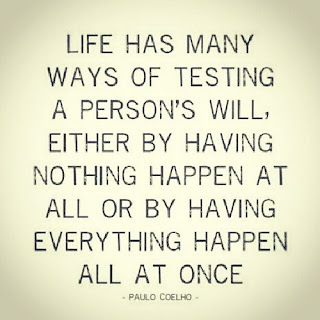 The Test of life! Write in then express your thoughts or opinions on the subject.